The field of NGC 6525 was monitored during three months from June 2013 to August 2013. We performed Johnson–Cousins BVI photometry using a 235 mm Schmidt–Cassegrain telescope, equipped with a SBIG ST-7 XME. The gain and readout noise for the CCD used were taken to be 2.62 e-/ADU and 15.98 e- respectively. Basic data reduction has been performed with IRAF package ccdred, and for aperture and psf photometry we used IRAF package daophot. The coordinates were derived with the software tool astrometry.net (Hogg et al. 2008). To search for periods and epochs we used IRAF task pdm, the starlink package task period and the software tool FAMIAS (Zima 2008). Subsequently we searched for new short-term variables. 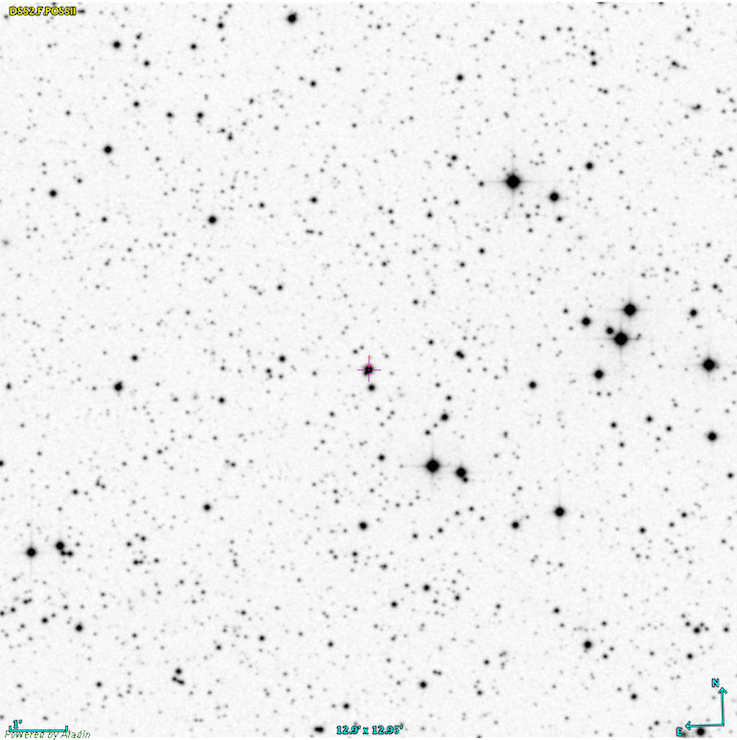 Our effort was rewarded by the identification of TYC 1012-563-1 as a new short-period variable. Combining our results for JD 2456449 with ASAS data (Pojmanski et al. 2005) we find epoch, semi-amplitude and period to be 2456449.5045, 0.061 and 0.0660032 d respectively (period analysis based on ASAS data supplemented by own observations shifted to common zero point). Because of the larger scatter in the ASAS data we decided to reject the ASAS data for further analysis. 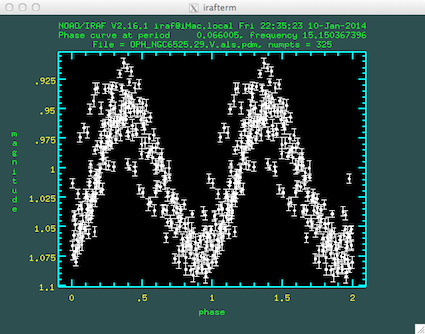 A period search with the FAMIAS yields period of 0.0660050 days (f0 = 15.150366 c/d) with S/N = 10.0 for our V-data with a semi-amplitude of about 0.060 mag in V, 0.074 in B and 0.033 in I. A further analysis of our V-band residuals yields f1 = 28.838778 (c/d) with S/N = 4.1 and period ratio 0.525 which is in good agreement with the expected period ratio of 0.521 for the third overtone. From UCAC4 we find the B and V magnitudes for TYC 1012-563-1 to be 12.487 and 12.163 respectively, i.e. B–V = 0.324 (not yet corrected for interstellar reddening) corresponding to spectral class F. This places a lower limit on Teff of approximately 7055 K.
According to these data we assume TYC 1012-563-1 a DSCT type star, oscillating in the fundamental mode and third overtone. From a recent period-luminosity relation (Petersen & Cristensen-Dalsgaard 1999) we then find Mv = –3.725 × log(P) – 1.969 = 2.428, Mbol = 2.428 + 0.049 = 2.477 and a mass of 1.7 MSun. A(I)/A(V) = 0.548097 ± 0.0646843. Because of the large error in the B-ratio our data were insufficient for further mode identification with the FAMIAS. Acknowledgements: This research has made use of the VizieR catalogue access tool, CDS, Strasbourg, France (Ochsenbein et al. 2000). The software package FAMIAS was developed in the framework of the FP6 European Coordination Action HELAS.